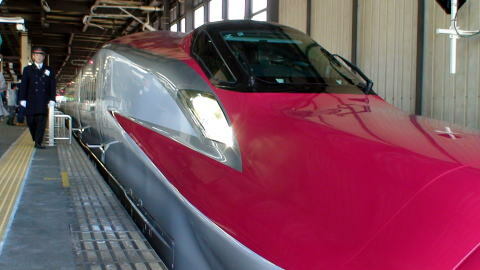 A crimson red bullet train 'Super-Komachi' debuted in March 2013. Photograph was taken by Junhaku Miyamoto, M.D. in March 2013. In March 2013, the high-speed shinkansen train series-E6 made its debut as 'Super-Komachi', bound for Akita. 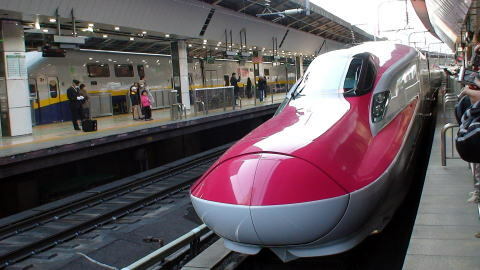 vehicle of the Series E6 features a nose 7 meters longer than that of the Series-E3 Komachi. 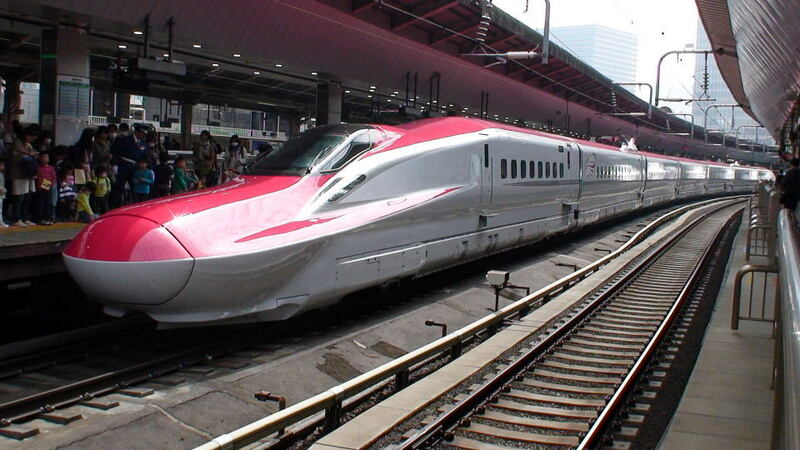 and Morioka, Iwate Prefecture, E6 cars will be connected with “Hayabusa” E5 cars of the Tohoku shinkansen-line. 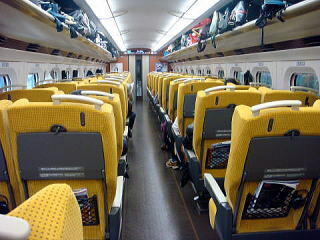 the same as TGV in France. 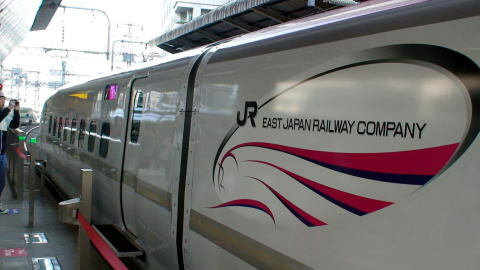 The JR-East railway company plans to increase its speed to 360 kms per hour by 2020. All Super-Komach shinkansen trains do not provide a smoking booth, and entirely smokefree. 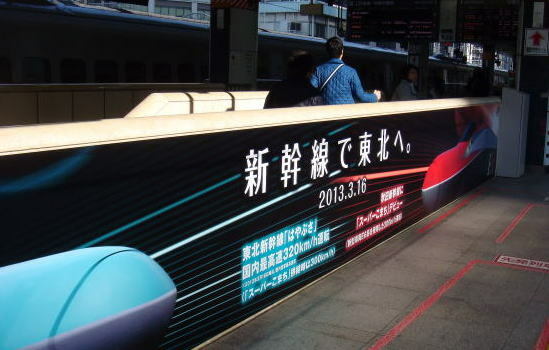 The photos show a super-express train, Super-Komachi, at the plateform of Tokyo Station, bound for Akita. 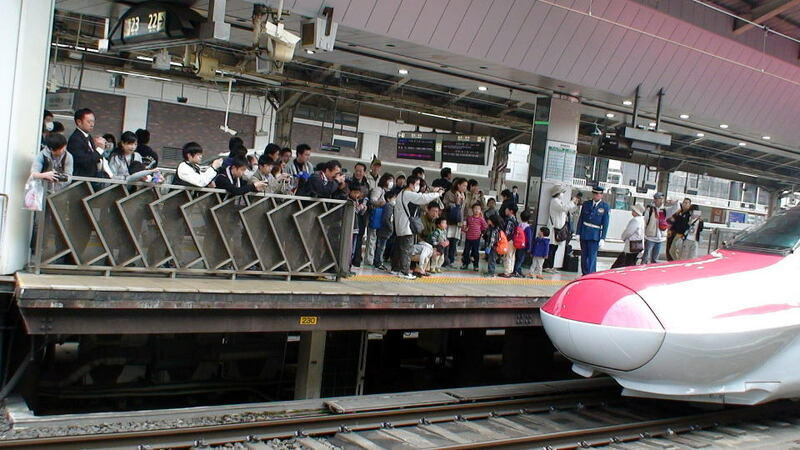 Many excited rail fans are taking a picture of the new-style crimson red super-express train, Super-Komachi, at the platform. 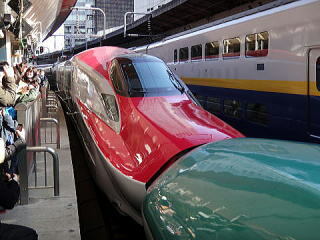 (L) This is a joint segment of Super-Komachi and Hayabusa, photographed at Tokyo Station. 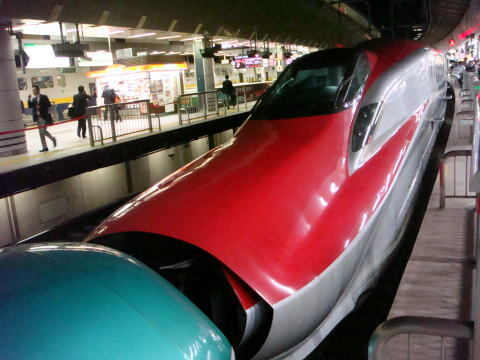 and Hayabusa at Morioka station. 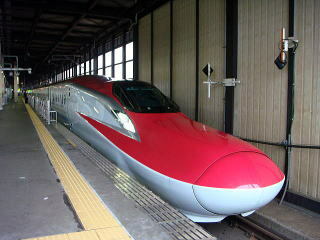 (R) The stationmaster at Morioka station sees Super-Komach express train off, which is now leaving for Akita. 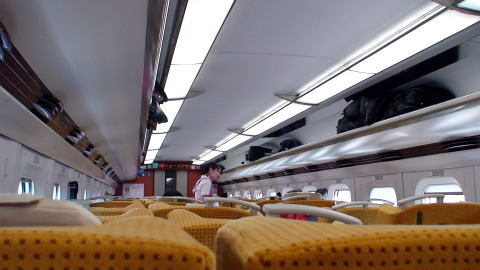 Interior of Super-Komach super-express train: The passage door is showing an ear of rice on the glass surface. 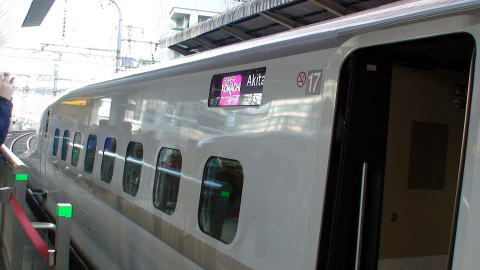 'Akita-Komachi' is a brand name of the rice produced in Akita. All above pictures were taken in March 2013. The right photo was taken at Morioka station in October 2013. 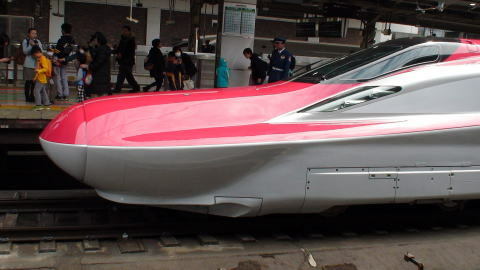 The vehicles of 'Super-Komachi' was connected with the vehicles of 'Hayabusa' at Morioka Station. This photo was taken in October 2013. 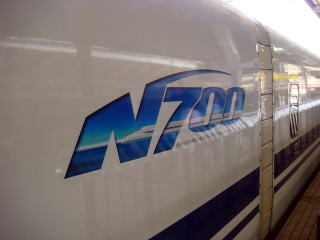 This is a video-recording from Shin-Aomori bound for Tokyo. 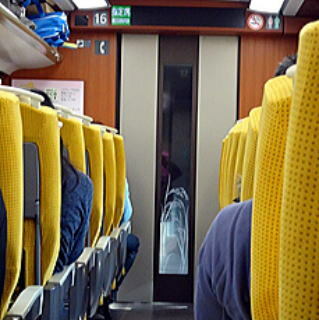 in a train are the superb service to train passengers.